Cast iron is a great cooking medium. Not only does it retain heat and heat evenly, in most cases it's a perfect canvas for one-pot meals. Best of all, you can serve right from the pan. Now who ever complained about fewer dishes? 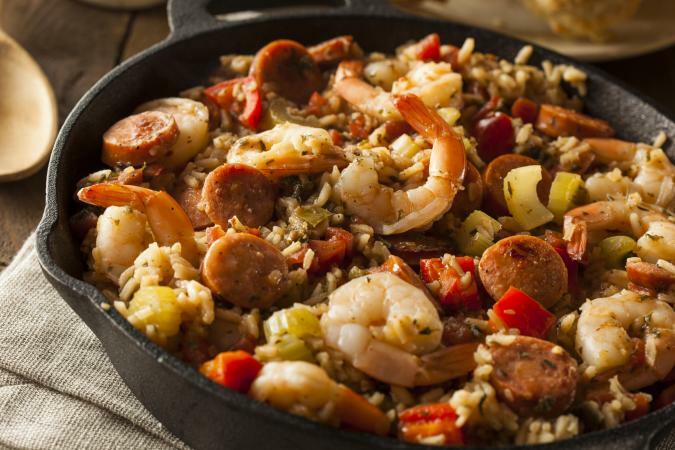 Jambalaya is a Creole/Cajun dish designed to make use of whatever was on hand. If shrimp were in your fishing creel, in the pot they would go. If leftover ham was in the pantry, that ended up in the cooking pot as well. In fact, the name "jambalaya" comes from the French word for ham which is jambon. Because this dish contains tomatoes, some people prefer to cook it in an enameled cast iron pan so the acid in the tomatoes doesn't react with the iron producing a metallic taste. There are no ill effects from this so the choice is yours. Use a deep-dish skillet for this dish. Heat skillet over medium heat until hot but not smoking. Add the oil and sausage slices, sautéing to brown, about 8 to 10 minutes. Remove to a bowl and set aside. If necessary, add butter to the pan and sauté the onion, celery and peppers until translucent, about 8 to 10 minutes. Add diced tomatoes, garlic, cayenne, oregano, thyme and tomato paste, mixing well. Add chicken stock and bring to a full boil. Stir in the rinsed and drained rice and return the sausage to the pan. Reduce heat. Add bay leaf, salt, black pepper and optional hot sauce, and bring back to a boil. Reduce heat and simmer, covered for 20 minutes or until rice is tender. Add half of the green onions and the shrimp, stirring well. Cover pot, remove from heat and let the shrimp steam for about 15 minutes until pink and fully cooked. Serve garnished with remaining green onions. Pass hot sauce at table, if desired. Chicken and biscuits never had it so good. 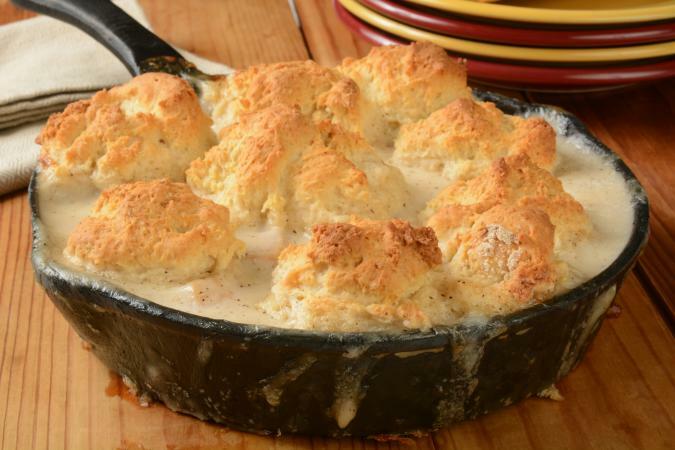 A cast iron skillet lets you nestle the biscuits close together so they sop up all that good gravy while they cook. Essentially, this is chicken stew with dumplings on top. A deli rotisserie chicken works well and a biscuit mix makes things a snap. Red Lobster Cheddar Bay Biscuits are awesome. Use a 10-inch skillet. Melt butter in a skillet set over medium-low heat and sauté onions until translucent and beginning to caramelize, about 10 to 15 minutes. Reduce the heat to low and whisk in the flour, stirring constantly for about 2 minutes to make a roux. Pour the hot chicken stock into the onion-flour mixture and whisk until smooth. Simmer over low heat for about 1 minute, stirring and scraping the bottom and sides of the pan with a wooden spoon, until thick. Add salt, pepper, sour cream and milk. Add the diced cooked chicken, carrots and peas, and mix well. Bring the mixture to a boil, reduce the heat and simmer while you make the biscuits. Heat oven to 375 degrees F. Make the biscuits from scratch or a mix and scoop 8 to 9 biscuits on top of the chicken mixture. Brush egg wash mixture on top of biscuits. If you are worried about messing your oven, place skillet on a rimmed baking sheet to catch any drips. But, for a better bake, the skillet should be in direct contact with the oven rack. Place in oven and bake for 30 minutes until biscuits are brown or for the recommended time on the package mix. Chicken mixture should be bubbling. Remove from oven and allow to cool a few minutes. Place the skillet on a trivet on the dining table accompanied by a green salad, if desired, and let everyone serve himself. A cast iron skillet is the perfect medium if you want your turkey to have a crisp brown crust. The even heating (no hot spots) of cast iron means every part of the breast will cook at the same temperature. Just remember to heat your skillet before searing the roulade. You will need a 12- to 14-inch cast iron skillet. After searing, this is finished in the oven. Don't save this recipe for the holidays. With the year-round availability of turkey, you can make this easy, delicious roast any time. Melt 2 tablespoons butter in a small skillet. Add 1 small finely chopped onion and sauté about 10 minutes or until soft. In a medium bowl, place breadcrumbs, finely chopped apples, raisins or dried cranberries, orange zest, and cloves. Add sautéed onion and mix thoroughly. Adjust seasonings with salt and pepper. 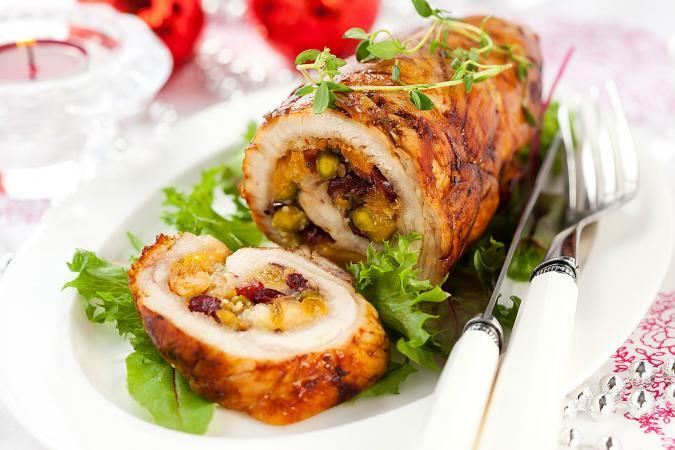 If the stuffing seems dry, moisten with a bit of orange juice or milk. If too loose, add more breadcrumbs. Set aside. In a small saucepan over medium heat, melt 6 tablespoons butter and add sage, thyme, paprika, and sugar. Place the thawed, rinsed and patted dry butterflied turkey breast skin side down on a piece of parchment paper or cutting board. If necessary, pound the meat very lightly so the meat is all of the same thickness. Season the entire surface of the meat with 2 teaspoons salt and 1 teaspoon pepper. Evenly spread the stuffing 1/2-inch thick over the meat, leaving a 1/2-inch border on all sides. If you have leftover stuffing, place it in a greased baking pan and bake it for 30 minutes. Beginning at one long side end, roll the breast like a jellyroll, tucking in any stray stuffing. Using butcher's twine, firmly tie the roast into a compact cylinder every 2 inches down the length of the roll. Let the roll come to room temperature. Heat a 12- to 14-inch cast iron skillet over medium-high heat until it is hot but not smoking. Add 1 tablespoon oil. Carefully place turkey roulade seam side down in the oil. Brown on all sides until golden, carefully turning the roll, for about 12 minutes. Remove the turkey roll to a plate. Heat the oven to 350 degrees. Add the mirepoix vegetables (carrot, onion and celery) to the skillet. Place the seared turkey roll on top of the vegetables. Baste turkey roll liberally with some of the herb butter. Place skillet in the oven and roast, basting occasionally, until an instant-read thermometer registers 160 degrees. Transfer the turkey to a cutting board to rest and loosely cover with aluminum foil. Add wine to the same skillet the turkey was roasted in and set on the stovetop over high heat. Cook until wine has almost evaporated, about 2 minutes. Add 1 cup chicken broth and simmer until reduced by half, about 8 minutes. Skim any fat from the surface. Place a small saucepan over high heat and strain the liquid from the skillet into it, discarding solids. In a measuring cup, whisk together remaining 1/4 cup room-temperature chicken broth and cornstarch. Then pour it into the saucepan and whisk until smooth. Bring to a boil, season with salt and pepper, and remove from heat. Arrange slices of the rested and sliced turkey on a platter. Pass the gravy at table. There really isn't much of anything that can't be cooked in one cast iron pan or another. Think outside the entrée box and try roasting veggies, making breakfast frittatas and dessert. Just think, if you can cook pancakes on a stovetop cast iron pan, you can cook a pie or cake in one. Try it!